Amoret, so new it still didn’t have its name on the outside. 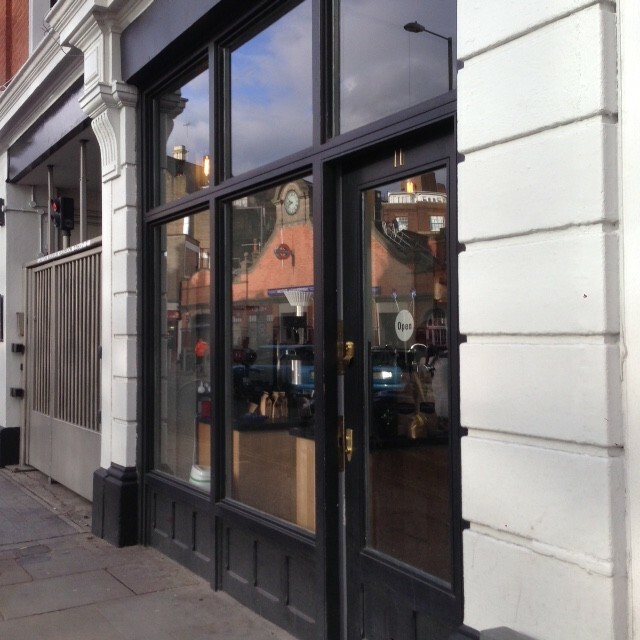 Amoret is a new addition to the coffee scene over in Hammersmith. Just up the road from the Hammersmith & City line entrance of Hammersmith tube station, I nearly missed this cute cafe when I walked past as it had no name on its frontage, nor did it have the chalk board that is characteristic of many cafes. Fortunately however, I had the address and so double backed to find a great little cafe. It appears that that majority of Amoret’s business comes from take-away orders although there is a small seating area at the back (it is small, when we visited in February, there were two chairs and a couple of tables/stools). If you are fortunate enough though to be able to take a seat at the back of the cafe, I would thoroughly recommend doing so. Not only can you enjoy good coffee in a nice environment, the friendly people behind the bar were very happy to chat about their coffee and cafe. Moreover, there is plenty to notice from this observation post at the back of the cafe. When we visited, the espresso based coffee was by Campbell and Syme, with V60s that featured different guest roasters (though it seems that other roasters also regularly feature for the espressos). I had a coffee from Panama, roasted by Union, which featured the word “caramel” in its tasting notes. I have simple tastes (‘caramel’ or ‘chocolate’ descriptions always go down well) but it was a great coffee. Complementary water was available at the counter with take-away cups (and water ‘glasses’ ) that were compostable and biodegradable*. 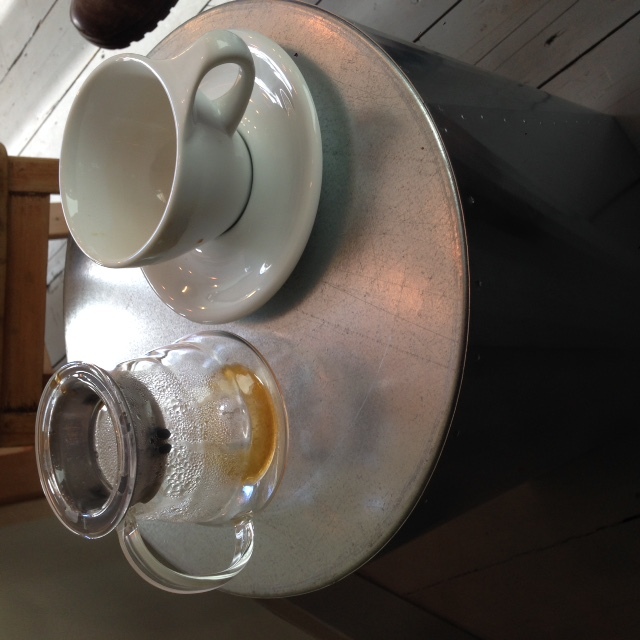 As the very friendly staff brought my coffee to the table, I noticed that the ‘table’ that I had put my water on was in fact a metal drum that sounded ‘clang’ as the cup was put down. The sound of the drum immediately suggested that the drum was hollow. We all recognise the sound of a hollow drum, it is partly about the pitch of the sound, but partly about the echoes that we hear as the sound reverberates inside the metal. After I had enjoyed my filter! The table-drum at Amoret. Does the drum sound the same in summer? Although it appears simple, the sound made by the drum is influenced by many aspects of the drum’s construction and surroundings. The stiffness of the metal and the atmospheric pressure affect the way that the drum’s surface vibrates, while the size of the drum and the speed of sound in air also affect the note, or pitch, that we hear. How is the sound of the drum affected by a change in its surroundings? For example, if the atmosphere in Amoret got much warmer, the speed of sound would increase, how would that affect the sound of the table-drum? A few years ago, Professor Timothy Leighton was wondering how the properties of the atmosphere affected the sounds of musical instruments. Specifically, he wondered what instruments would sound like on other planets. Take Venus. 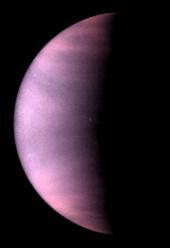 Venus is a planet with a very dense, very hot atmosphere. The surface temperature on Venus is 457C (Earth’s average is approx 14C) while the atmospheric pressure is 90 Bar (Earth’s average: 1 Bar). As it gets hotter, the speed of sound increases and so, to a first approximation, the note made by the drum-table at Amoret will sound higher as the air gets warmer. However, the metal of the drum is also hotter on Venus (so less stiff) and the density and pressure of Venus’ atmosphere will act to further complicate things. So to start thinking about how things sound on Venus, we would be more sensible to think about a simpler instrument, such as an organ, which is only affected by the change of the speed of sound†. Take the famous case of Bach’s Toccata and Fugue in D minor. Played on Venus, the researchers found that, rather than be in D minor (293.66 Hz), it would have the pitch of F minor (at 349.23 Hz). You can hear Bach’s Toccata on Venus (Mars and Titan) here. What about a human voice, how would a person sound on Venus (were they able to survive)? In humans, the pitch of the voice is determined by the rate of vibration of the vocal cords. So it is possible to construct a speech synthesiser to imitate human speech by modelling such a voice ‘box’. Erasmus Darwin, (grandfather to Charles) made such a device in around 1770 with wood, leather and silk‡. Darwin’s voice synthesiser could pronouce the sounds ‘p’, ‘m’, ‘b’ and ‘a’ and so ‘mama’, ‘papa’, ‘map’ and ‘pam’, which by some accounts was convincing enough to fool people into thinking there was a small child in the room. Why did people think that Erasmus’ ‘child’ was small? It turns out that just as with the drum, when we listen to people speak, we do not just register their pitch but also the echoes on their voice. Each time we make a sound, the sound travels from the vocal cords down to the lungs (where it gets reflected upwards) and up to the mouth (where it gets reflected downwards). We subconsciously listen for these echoes and, if they take a long time to appear, we deduce that the person is large (there is a greater distance between their voice box and their lungs). If the echo comes back quickly, clearly the distance between the voice box and the lungs is smaller and hence the person is smaller. Just like the drum at Amoret, the human voice is a bit more tricky to model on Venus than Erasmus Darwin’s device allowed for. Leighton and co-author Andi Petulescu considered the question of the sound of the human voice on Venus in their 2009 paper. Firstly they said, the density of Venus’ atmosphere would make the vocal cords vibrate more slowly, so the person speaking would sound as if they had a deeper voice. But secondly, the high speed of sound on Venus would mean that those echoes that we listen for would come back very quickly, so we would perceive the speaker as being small. What does this sound like? A few years ago, a Dutch TV show set this very topic as a question for their annual quiz and answered it by one of the co-hosts singing Banarama’s “Venus” with, and without, the Venus voice changing software of Leighton. If you understand Dutch, the full clip is below. If you don’t understand Dutch but would just like to find out how you would sound on Venus while singing Banarama, forward to 7 minutes in for the version on Earth and 7m46 in for the Venus version. It is not easy for us to travel to Venus to investigate whether Prof. Leighton was correct. It is possible for us to repeatedly visit Amoret to investigate how the coffee cups sound as they are put on the drum as the temperature changes around us. This seems a fantastic excuse to revisit to me. * It should be noted that ‘compostable’ plastic has a very specific definition that does not mean that it can necessarily be composted in the way that you or I would understand the term, as I described in more detail here. Nonetheless, it is definitely a significant improvement from conventional plastic and I would love to see more cafes follow suit with environmentally sound packaging. † Of course this comes with a fair few caveats, not least the fact that the organ has to have flue pipes only. I would thoroughly recommend browsing Professor Timothy Leighton’s excellent webpage on this and other aspects of acoustics which you can find here.